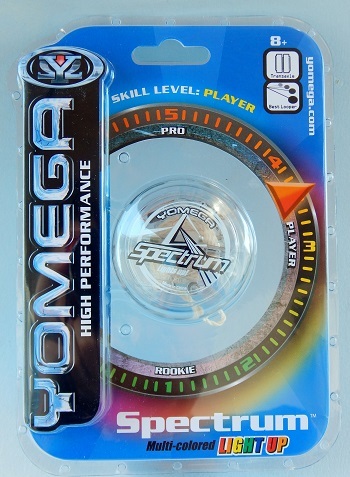 The Spectrum is from Yomega's Player level product line of yo-yos and was first introduced in July, 2013. Original retail price: $10. Features a plastic transaxle bearing sleeve and has a starburst response for original play. What sets this model apart from the Fireball model on which the Spectrum is based, is the LED multi-color light display that activates when the yo-yo is spinning. 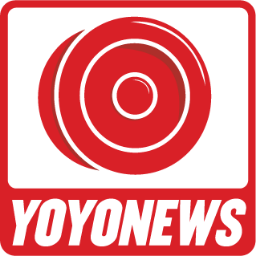 The Spectrum replaced the Lightbeam which replaced the Strobe Yo in the history of Yomega light-up yo-yos. As of mid 2018, Yomega's yo-yo product line was divided into four groups depending on your yo-yo experience: Rookie, Player, Pro, and Elite. Rookie - Consisted of the Brain, Power Brain XP, and Alpha Wing. Player - Consisted of the Fireball, Xodus II, and the Spectrum. Pro - Consisted of the Maverick (solid), Maverick (splash anodized), Raider, Starstruck, Ooch, and Dash. Elite - Consisted of the Prodigy (solid colors), Prodigy (splash anodized). The Magnetar was a new Yomega yo-yo introduced in February, 2018.